Trigard Memorials: Which would you choose? You've invested in a beautiful mausoleum, picturesque landscaping, technologies for a pleasant indoor environment and products to protect the casketed remains. When it's time to select crypt plates, why choose anything but the best? 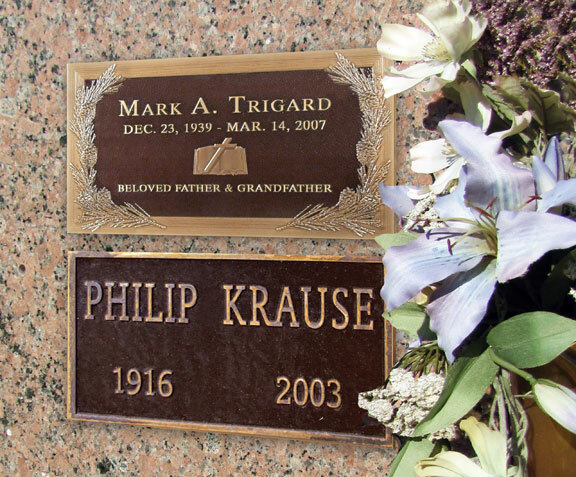 Trigard Memorials' sleek bronze and aluminum crypt plates are as carefully planned and constructed as the mausoleum itself. Our high tech, direct-to-metal machining process allows for direct photo replication, resulting in the finest detail in faces and images. And all of our memorial products offer attractive profit margins and target customers who appreciate quality. Visit us at the 2013 ICCFA Convention and Expo and see for yourself why our crypt plates are the best. Ready to order? Call Customer Service at 800.798.4900.